This past Wednesday, April 3rd, I participated in Advocacy Day sponsored by Solve ME/CFS and MEAction. I joined over 234 other advocates who spread out over Capitol Hill to more than 224 Senate and House offices to change minds through personal stories, education and facts about Myalgic Encephalomyelitis (ME), commonly known as Chronic Fatigue Syndrome (CFS) or ME/CFS. ME/CFS is one of the invisible illnesses I work hard to highlight and bring into the light. I teach others to redesign their lives with ME/CFS through journaling tools, yoga therapy, meditation and essential oils. And I write and speak up for those afflicted. One of my pieces in the Huffington Post went crazy viral in 2016 - 3 Reasons Why An Invisible Illness is More Dangerous-Invisibility Presents Extraordinary Obstacles Depending on Who is Blind to Your Illness, and being invisible to your own government was one of the perils I discussed. My efforts this week were a manifestation of my continued commitment to help the invisible get seen and acknowledged so we can get the help we need. Advocacy is empowering. Not everyone is able to channel their anger at the injustice into advocacy, and certainly the sickest in our society are often TOO sick to fight for awareness, research dollars, and fairness. The fact that this day even happened feels astonishing, and I am so deeply grateful to the two organizations and the very many wonderful people who made it happen - Solve ME/CFS Initiative and their Director of Advocacy and Community Relations Emily Taylor, as well as MEAction and their US Advocacy Manager Erin Roediger. The event was bittersweet for me as it made me miss being well and strong and being able to do this sort of activity, as I used to, all the time. But sweet too as I was amazed by the commitment of all those in attendance and working so very hard for change. There were people there from around the country, many who are very sick and struggle daily. Numerous family members were there on behalf of loved ones who are debilitatingly ill. I spoke with a woman from Oklahoma who was there for her sister. Speaking with her touched me deeply and made me very sad - to the point of tears - as I am not blessed with similar strong advocacy and support from my own family. I met a terrific couple who travelled from Hawaii! I recognized them and thanked them for their activism; they are truly committed people making a difference. Several people came up to me and acknowledged the work I did last year when I stepped up to spearhead the Millions Missing Day last May 12th, 2018 on the Freedom Plaza here in DC. Their thanks was unexpected and meant so much to me because I physically paid for that effort for months after. The DC woman with whom I was partnered to meet and speak with Rep. Norton’s office is an amazing person who will be a friend and nearby comfort too. ME/CFS is one of the invisible illnesses I work hard to raise awareness and support. Several of my clients, as well as I, navigate this challenging affliction every day. Many of you know already, too too well, that ME/CFS is a devastating multi-system disease that causes dysfunction of the neurological, immune, endocrine and energy metabolism systems. It often follows an infection and leaves 75% of those affected unable to work and 25% homebound and bedridden. An estimated 15-30 million people worldwide have ME. [ME/CFS patients] feel effectively the same every day as an AIDS patient feels two months before death; the only difference is that the symptoms can go on for never-ending decades. My first job after college was as a legislative aide for the Congressional Arts Caucus, and being back in my old haunts felt surreal. Advocating for those with my illness to our representatives felt full circle. I adored working on Capitol Hill. I did a summer internship during my college years as well. Working in government, and loving it, was what first drew me to Washington DC. But first, on Tuesday I attended the Advocacy Training Workshop. Even though I knew a lot from my own stint working as a legislative aide, I still learned what the priorities were for this year and specifically what we were petitioning for. Support 2 appropriation request letters before the Defense and Labor/Health and Human Services committees. Schedule a social media post for International ME/CFS Day this May 12, 2019. After the three hour training, a networking gathering provided time to meet up with our cohorts and partners for the next day. Adriane Tillman, Editor & Communications Manager of MEAction, interviewed me to ask why I was there and what motivated me. Many feel as strongly as I do and overcame as much or more obstacles than I, and being surrounded by so many others like me was heartwarming and amazing. This interview was spontaneous and unexpected, but luckily I had just reread my Huffington Post piece on the perils of invisible illness so that helped me sound coherent despite the immense pain I was in and the brain fog I had by the end of the day. When I got home Tuesday night, the pain was so awful I had trouble sleeping. The cold, damp rain and the hour long drive back to my home likely didn’t help. I did my best to soothe myself and not resist the discomfort in my body. But it was hard not to fear what I would have to endure in the morning. And indeed, the next day I woke feeling very weak and still in so much pain that I was in tears on the way to Capitol Hill. I didn’t take any medication in the morning because I wanted to be able to think clearly. 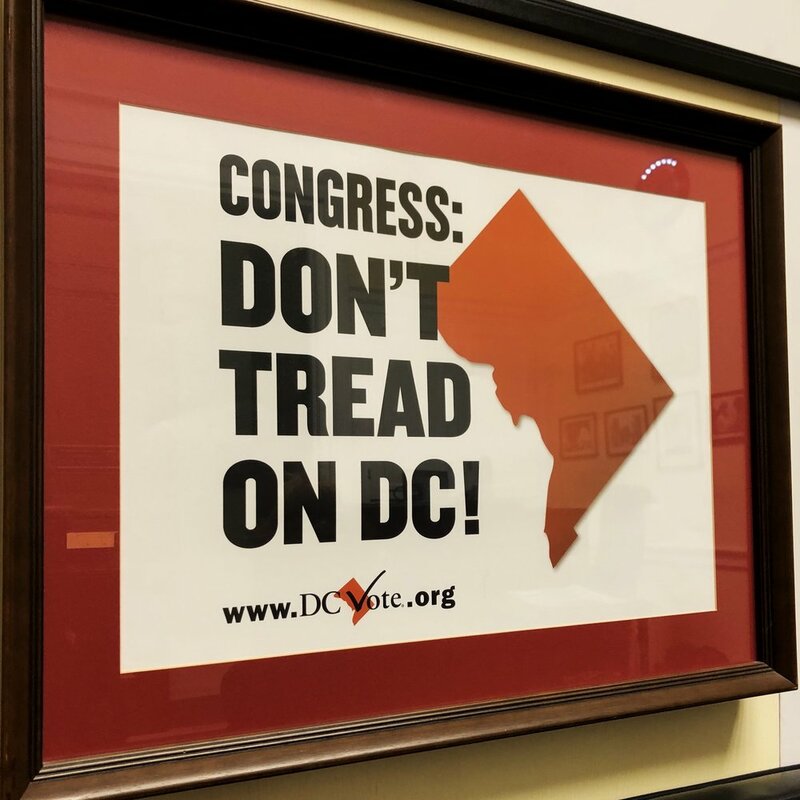 There’s construction going on at the Capitol building itself and in the Cannon House Office Building, which was where the room for our “basecamp” was located. And that meant a lot of challenging extra walking. I aborted my plans for the day early on Wednesday to get home and horizontal. I ended up taking my opioid medication for the first time this year later in the afternoon. Days later I’m still recovering, as are many, many others who pushed to participate in the Advocacy Day. Still, the meeting we had with a legislative aid in Rep. Eleanor Holmes Norton’s office went very well. She had already signed onto a letter of support for our appropriations requests and is supportive of our efforts. Even though our DC representative is one of 5 non-voting representatives, Norton Ranked Most Effective House Democrat in Academic Study. Norton’s ranking is “noteworthy because she is a nonvoting member.” That makes this ranking an even bigger deal! Because the evaluation ranked her proactive work - her own legislation and not her ability to block and stop other legislation, the top rank proves her persuasiveness and power in Congress. DC is lucky to have her. I very much enjoyed discussing DC statehood with the young man in the front office. I felt more optimistic than I have for years about DC getting voting representation in Congress. There hasn’t been a vote on DC statehood since the early 90s. If we get that, we will get two Senators too! And on the way there I tweeted about my excitement about the meeting and kept looking up Elizabeth Holmes Norton instead of Eleanor. Elizabeth Holmes is the name not only of the Theranos founder and subject of the HBO documentary The Inventor, but also a journalist who also does the delightful So Many Thoughts on Instagram. That’s the brain fog for you! I’ve been bedridden the three days since, not surprisingly. The pain and sleeplessness has been immense, but to have participated in this special day was very much worth this high cost. What can you do to help? See below! Use this online tool from Solve ME/CFS Initiative to do it in less than 3 minutes. Use this tool to find the phone numbers and a helpful guide along with a suggested script. These phone calls matter; the staff tabulate them and report on them once a week.